As a culminating project for my time as Artist-in-Residence at Tye River Elementary, I had the opportunity to design an installation piece for the school cafeteria. 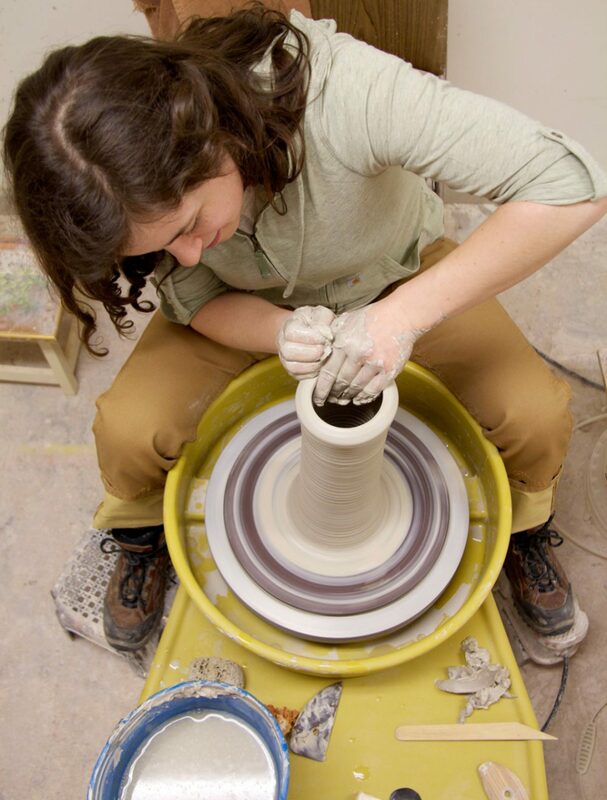 Inspired and emboldened by the Pre-K – 5 Art Teacher, Claudia Van Koba, to be interdisciplinary in my lesson planning, I decided to delve into the sciences for this unit. Clay would be the medium, but the content of the piece was wide open. 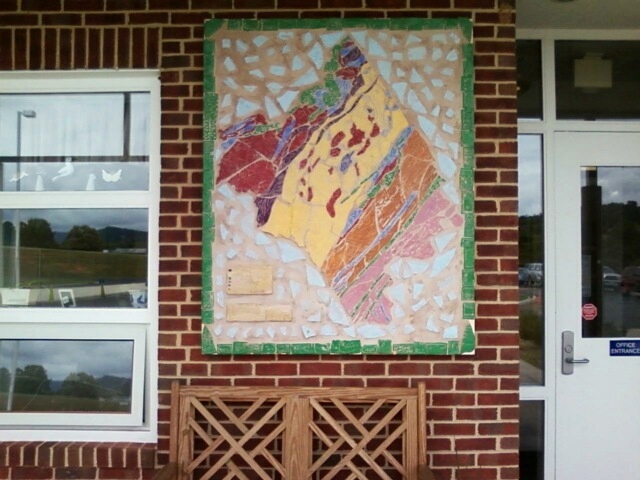 In my forays to the Nelson County Public Library, in Lovingston, I was inspired by a geological map of the county. I was fortunate enough to be able to allot the final 2 months of the school year to this project. I hate making the kids feel rushed – they feel that way all day in school and I try to make my classes a respite from panic and worry. 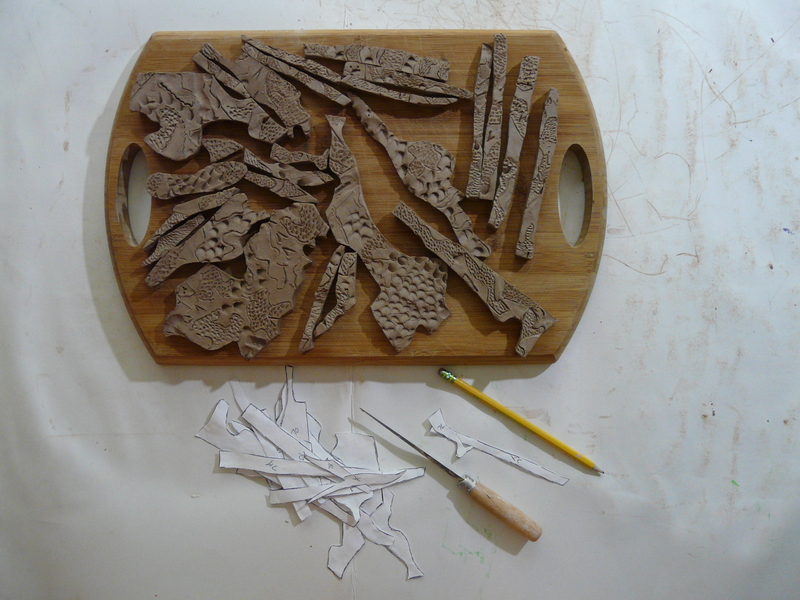 Having ample time for the kids to turn this image into a clay tile mural was a true gift. Each of my classes spent a day working on the tiles that would end up in the background and border – practicing textures on slabs of clay, signing their names and inside jokes, and talking about geology in general. We talked about how mountains are formed, the three types of rocks, and what clay looks like under a microscope. The kids got really excited that the “mud” tiles they were carving would be turned into rock in the kiln. In the next class cycle, each of the classes specialized and studied one rock type. We looked at microscopic pictures of the rocks, and then imitated the texture on big slabs of clay. 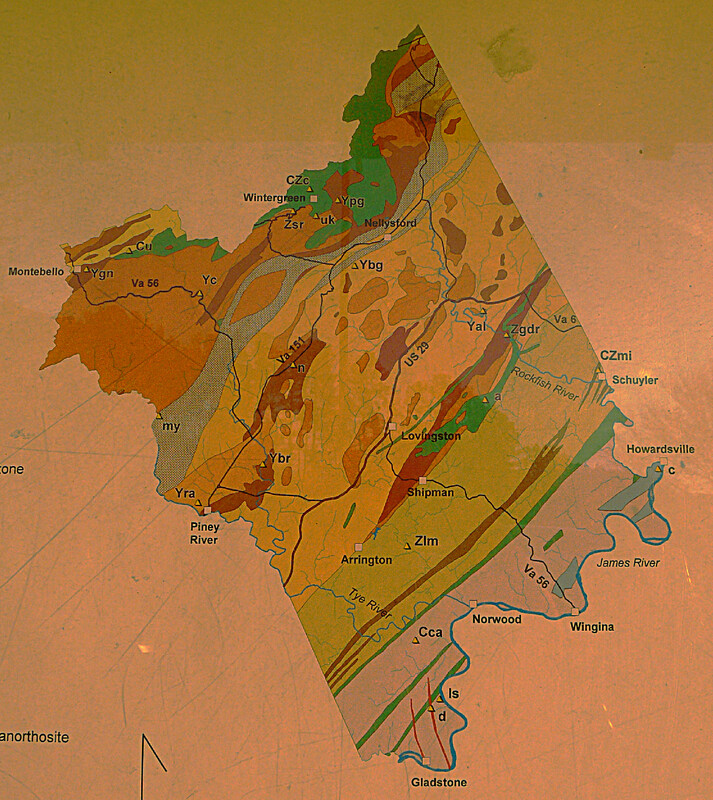 Mylonite, one of Neslon County’s bedrocks. After each class, I’d take the slabs home and use the template I’d made of the map to cut out the individual tiles from the textured slabs. THAT was more work than I thought it would be. But you know what? It was all totally worth it. After firing and painting the tiles, putting all the pieces together like puzzle, and grouting them onto the wooden mount, I was BEAT. But the final result couldn’t have been better. 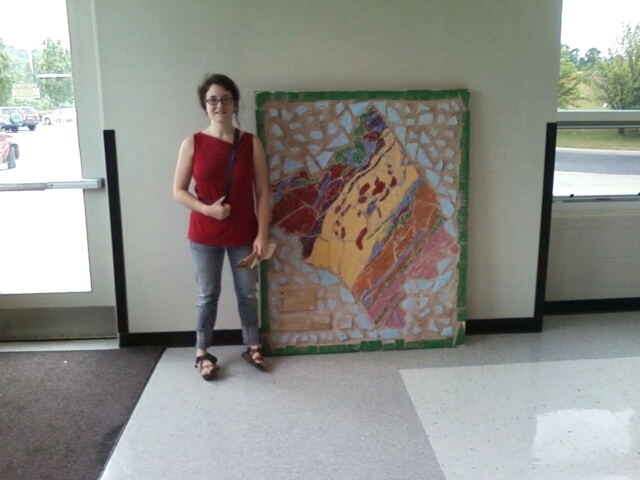 I delivered the piece to the school on the last day before I left Virginia, and this is where it was originally meant to be installed – in the cafeteria-auditorium space with lots of natural light. During the classes, I heard a bit of grumbling about the fact that the kids wouldn’t be allowed to take the tiles home. I explained to them that it was a far better thing to contribute to a permanent improvement to their school, one that they could come back and visit for years. At that point I got some nods, but I know I didn’t convince many of them. There is something so immediately satisfying about crafts classes where your final product is like a souvenir. I’ve found this to be the case in most of the crafts classes I’ve taught, to people of all ages. However, I think much, much more can be gained from the collaborative art experience, when the self can be released into the communal. There is much less competition and self-judgment when students work together on a project. And beyond that – I’ve noticed far more affirmation, cross-clique communication, and camaraderie in classrooms when working on such projects. That alone makes these kind of ventures worthwhile. The arts have a unique power to create such energy in a classroom, where grading systems usually isolate and rank students on a daily basis. I’m so glad I had the opportunity to expose my students to the experience of a creative, collaborative endeavor. When word got out that the mural was at the school, my kids came running. They searched and searched to find the tiles they’d made, to point out where they lived, and to brag about it to their friends. “It’s going to be here FOREVER,” I heard one of my third-graders exclaim. Turns out, once the Principal saw the final product, he decided to install it in another location: the main entrance to the school. We are all honored to have it displayed there. Truly, I feel honored to have had this time with these kids. The last two years have taught me so much about working in public schools, keeping kids interested and inspired by art, and about the magic that happens in a safe space of learning. An experience like this one can be as transformative for the teacher as mud into mural.